Local designers and makers have enjoyed a ‘Crafters Showcase’ at Flowerfield Arts Centre recently. With 30 crafters on display, the audience of retailers and tourism trade had the opportunity to meet directly with the makers and learn more about their crafts. The Mayor of Causeway Coast and Glens Borough Council, Councillor Brenda Chivers pictured at the 'Crafters Showcase' at Flowerfield Arts Centre with Woolly Wild Folk, Zoe Bratton, Tourism Product Development Officer, Causeway Coast and Glens Borough Council, Jack McGonigle Ceramics, artist Alison McKnight and Tonia Kennedy from Fused Glass Products. The 'Crafters Showcase' took place at Flowerfield Arts Centre in Portstewart. 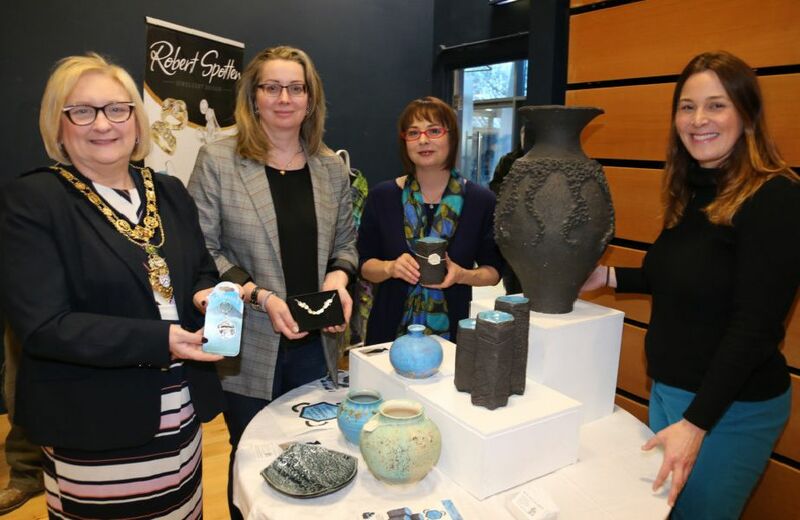 The Mayor of Causeway Coast and Glens Borough Council, Councillor Brenda Chivers pictured with representatives from the Makers House at the Designerie at the 'Crafters Showcase' at Flowerfield Arts Centre.